Over the past four years I must have been to Paris at least 20 times. Since one-of our industry centres-of-excellent was located in Paris, along with a major subcontractor, this gave me a lot of opportunity to travel there and see the city over a period of a few years. I made it a habit of trying to arrive Sunday morning, walk around to stay awake and shake-off the jet-lag. When I vacationed there about 15 years ago, I hit most of the major sites – but this blog entry is not about that. It’s about all the places I discovered in my travels that are worth seeing in Paris, for a more authentic experience. On one of my trips, I was sitting in the airport lounge prior to my flight to Paris and remarked an unusually high number of mother-daughter pairs in my vicinity. This was Spring and apparently everyone had the same idea about maternal bonding. One pair was sitting across from me and had guidebooks and maps, discussing the potential sites and areas to visit. I couldn’t help myself and jumped in with some suggestions – they were so pleased and happy to get some ideas about what to do, since you know that finding good ideas in a brand-new place is very hard, especially in someplace as touristy as Paris can be. I hope they enjoyed my suggestions. The stuff listed below was on the list. Relais De L’Entrecote and La Derniere Goutte are close together in St. Germain, you can add-on a nice visit to St. Germain des Pres church and have a look inside. Have dinner or lunch first then wander over to the wine shop and go crazy. Place Dauphine and the Musee De L’Orangerie are close-by, you can walk through the Jardin Tuileries and the Louvre area starting at the museum and then have a mid-afternoon drink at Rose de La France. Montparnasse has a lot of places with Crepes, it is known for that around that area, and this is close to Chez Milou (if you wanted to grab a crepe, explore the Montparnasse area and then grab dinner at Chez Milou, that would be a good idea). La Tour Montparnasse has an observation deck that is great for night-time viewing. Making a little trip after dinner at Chez Milou would be a good idea, you could spend about 20 minutes gazing over Paris (including a perfect view of the Eiffel Tower). The best time of year to visit Paris is the early Spring or late Fall. The summer is absolutely crazy with tourists, but you can still use my tips to find the places that give you an authentic experience. 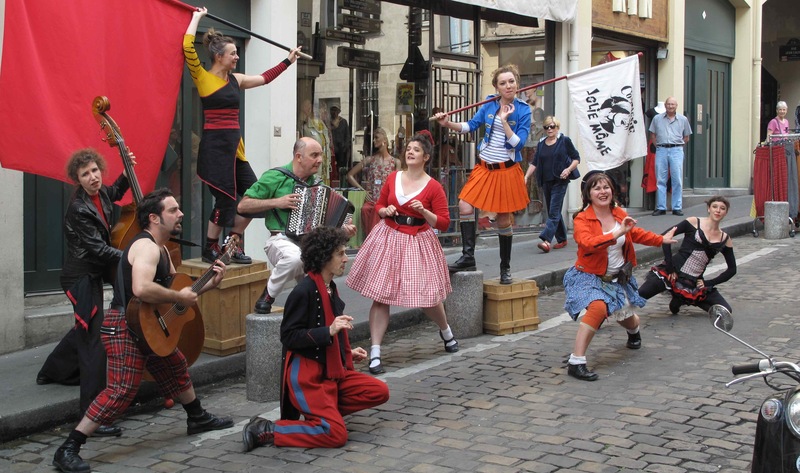 The Rue Moffetard is one of the top-rated shopping experiences in Paris. It is a market street in the fifth arrondissement in Paris. This is a narrow, charming street that hosts lots of little shops, cafes, food and wine vendors. On occasion, I have seen troupes performing in the streets as well. It is best to start at the bottom on the street, Square Saint-Médard, where there is a nice fountain and church. If you start-off there in the morning, there is a Starbucks if you want to grab a coffee to get energized for the up-hill walk. I try to get there early, but not so early I can’t stop half-way up the street for a bottle of wine. It’s perfect to sit there and people watch. This is an authentic Paris experience – and, it is a must see and on the top of my Paris list. The Musée de l’Orangerie is a small art gallery located near the Louvre. It is art gallery of impressionist and post-impressionist paintings located in the west corner of the Tuileries Gardens next to the Place de la Concorde in Paris. 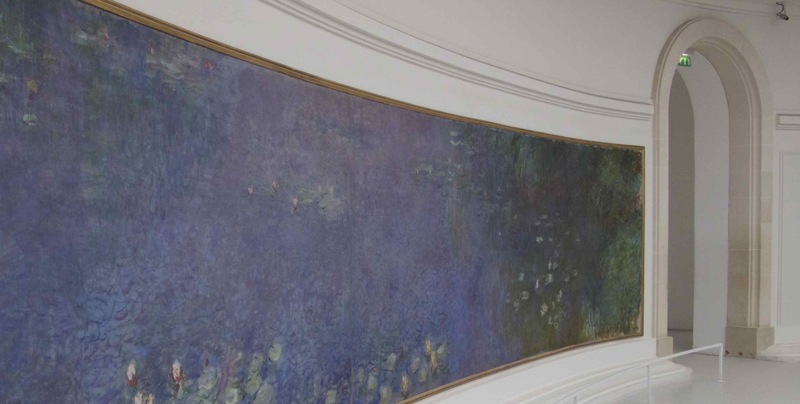 It contains the Monet Water Lilies in a spectacular natural light presentation, along with Impressionist art from the collection of a private art dealer. Even in the busiest seasons, I have never had to wait to get in. All the other tourists are flocking to the Louvre or the Musee D’Orsay (which I also love, by the way). This is an amazing way to see some art and not be overwhelmed with a huge museum – you can get through here in about 1-2 hours and still feel like you got a good taste of Impressionist art and culture. Not a huge commitment, not a lot of crowds, and worth it. The Place Dauphine is a public square located right on the Île de la Cité in the first arrondissement of Paris. The interesting part about this square is that it is right in the middle of one of the busiest parts of Paris, but generally hidden away. This is a perfect place to take a pit-stop for some nice wine in a cafe – I usually stop at La Rose de France (it’s not a “must-eat at” place, but it is very quaint and matches the vibe I look for when stopping here). I also noted that Trip Advisor shows good reviews for this square as well. At first thought, the idea of trekking around Paris on a bike seems a bit daunting. There are these seemingly clunky bikes, with these odd machines to check them in-and-out. However, once I tried the Velib, I was completely hooked. Vélib’ is the public bike service that allows you to pick-up a bike at one station, ride it around and to another station to drop it off. It is an amazing way to see Paris, and a darn quick way to get around. You can purchase a 7-day ticket that ties to your credit card, and you use a code on this ticket to check-in/out. There are stations everywhere. Some of my happiest days were those in which I biked around Paris in the Spring, with 15-20 degree weather, nice cool and clear skies. Once you know where to go, it is much faster than the Metro – you can see a lot of Paris on the bike, and consider using a bike along my recommended walking routes (see Walking below). Chez Milou is a very unassuming little restaurant near Montparnasse on Rue Du Maine. One of the things I like about the location, is that it is tucked away overlooking a nice square, and in nicer weather the restaurant is open air with the full length windows/doors open to the square. I find french restaurants and food to be pretty bland and similar. However, if you want a nice authentic french restaurant experience in a cozy atmosphere, this is the place for you. The owner is on the premisis, a feisty older lady who runs a tight ship and aims to please. The menu is small, changes frequently and would satisfy your need to taste french cuisine. I have eaten there many times and it is near the top of my list. Why is one of my favourite restaurants in Paris an Italian restaurant? La Grande Venice is consistently recommended and gets good reviews. I have eaten there at least four times, and each time was fantastic. The antipasto platter cannot properly be called an appetizer because you could feed a family of six people with what they put in front of you. I recommend trying to go to this restaurant with at least three of your closest, and hungriest, friends. You should order the antipasto platter. One cool thing about the restaurant is the centrepieces they put on the tables – they are constructed from peppers, tomatoes and other vegetables. It looks like a bouquet, but, sure enough, it is edible. If I had not gone with someone who had already been there, I would never have known to partake in this deliciously fancy starter. They provide oils, salt and spices to make yourself a little tomato treat. The entrees are all fantastic, and I particularly enjoy the seafood pasta. The finale should be the carmel ice-cream which they shave off from a home-made tower – no description is required, just look at the photo below. All hail the tower of caramel infused ice cream! You can have, steak-frites or if you don’t like that, you can have steak-frites. 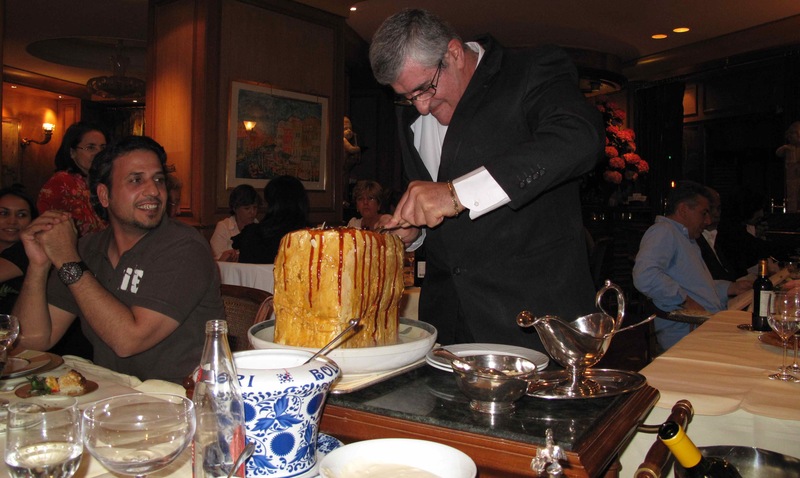 The Relais De L’Entrecote is a restaurant that specializes, and serves only, steak-frites. There are a few locations in Paris. My favourite is the one near Saint Germain Des Pres, because it is tucked away and less busy. They do not take reservations. When the waitress approaches you for the first time, the only questions she asks is “how do you like your meat cooked?”. The meal consists of salad and bread as a starter, and steak-frites in two servings (they cut it in strips, and keep half warm for you). The sauce is what makes this special. I do not know what they put in it, but, damn, it’s good. The house red wine is pretty good and perfectly adequate for the meal. It’s a simple meal, but very tasty and I always try to get back there. The line-ups can be long during the busy season, so try to go early or eat a bit later. What do they put in that sauce? Yum. If you are in Paris, buy some wine. I use a soft-sided Wine Travel Bag that has a plastic seal interior and has a thin padded wrap; I carry two of them and always take back wine. You will need to pack this in your suitcase. People get nervous about doing this, but the likelihood a problem is low – especially when you use this technique. I stumbled upon this little place near Saint Germain des Pres, in the cross-roads of a few of those “twisty, turny” odd Parisian streets – it could not be located in a more interesting “nook”. 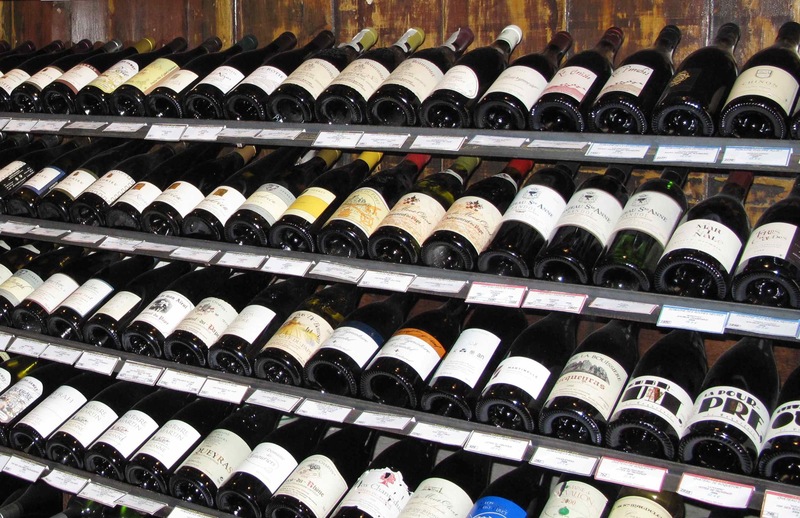 La Derniere Goutte has an excellent selection of top-quality wines, and the staff a very helpful. When you visit this place, it’s not just about going shopping – sample their daily sampler, talk to the staff, and take your time making a pick. How much can I fit on my Velib bike? You need to walk to appreciate Paris. 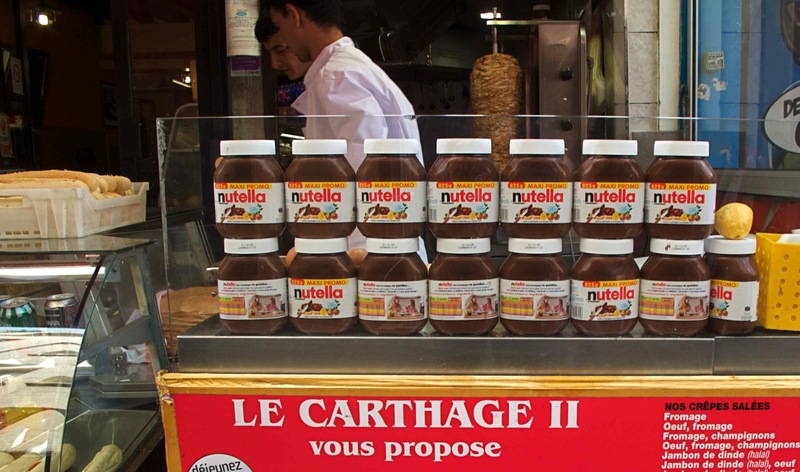 When you do walk through the more densely populated regions, you will run across a crepe stand or store-front. When you roll-off the plane and start walking around to cure the jet-lag, grab yourself a banana and Nutella crepe. You can this not give you a tasty kick-start? Loop through Jardin des Tuileries to St. Germain des Pres. A lot of the places I mentioned above are within reach of a single area. You can start at the Musee D’Orsay, take a peek, and cross the river to Place Concorde to see the obelisk, then walk to the Musee De L’Orangerie and through the Jardin des Tuileries. Along this route you will head to the Louvre for a peek, then you can cross across Point Neuf. This is where Place Dauphine is located. You can then head toward Saint-Germain des-Pres which is where Relais De L’Entrecote is located and the wine store. This is about 3-4 km of walking. If you want to add another wine-shop side-trip, head over to the Rive Droite to Lavinia, which is near L’église de la Madeleine – from the Jardin des Tuileries, head towards Place Vendome and then up to the shop (Lavinia offers dinner where you can select wine from the wine-store, when I was there they had live entertainment in the evening – talk about a kid in a “candy store”). Saint Paul to Montparnasse. 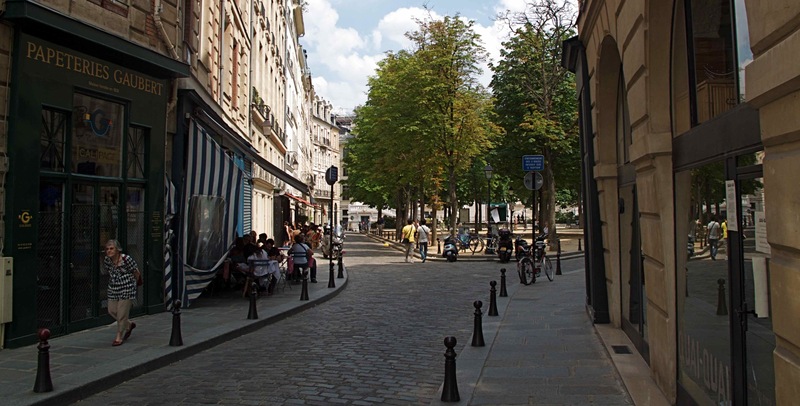 The area around Saint-Paul, Le Marais, is a historic district which is a very nice walk. In this area you have some interesting sights, like the Hotel de Sens and the Paris city museum. I would start at the Mont-Marie metro station. You can explore the fourth arrondissement, head towards Les Vosges and then back to Musée Carnavalet. Then, cross the river at Ile St. Louis towards the Pantheon, then over to the Le Jardin du Luxembourg (make sure to stop and see the Medici Fountain). Before heading to Montparnasse, head towards Montparnasse cemetery. La Tour Montparnasse has an observation deck that is great for night-time viewing, it is a bit on the touristy side, but this is the best night-time view of the Eiffel tower and Les Invalides and a lot less busy than the Eiffel Tower. Making a little trip after dinner at Chez Milou would be a good idea, you could spend about 20 minutes gazing over Paris (including a perfect view of the Eiffel Tower). Eiffel Tower and Champs. This gets you a bit more of the main-stream landmarks, and I mean a lot of landmarks. You should start your walk at Tracadero where you would have a nice view across the river to the Eiffel tower. Walk over to the Eiffel tower, but just keep walking (marvel from beneath, or get there real early and go up to the top), because this area is super touristy and busy. Proceed along the Champ de Mars (the long park in front of the Eiffel Tower), but double-back and ahead across to Rue Cler. This street runs alongside the Champs de Mars and is a fantastic little street filled with shops, cafes and bakeries (another example of an “off-the-beaten track” place to get an authentic local experience). Then, head over to Les Invalides and Le Tombeau de Napoléon and towards the Seinne and across the bridge Point Alexandre III. This is the most beautiful bridge in all of Paris and the view back towards the Eiffel tower, especially at night, is fantastic. All of these are nice landmarks. Keep walking to the Grand Palais and beyond to the Arche de Triomphe and then down the Champs Élysées to Place de la Concorde. This is about 6 km of walking, so plan for a couple of hours. You can merge continue the walk with the Jardin des Tuileries which would make it about 9 km (you’ll sleep good that night, that’s for sure). How come you didn’t mention hotels? I always travelled there on business and stayed at the Marriott Rive Gauche. It is a nice hotel, but not necessarily close to anything in particular. If you stay there, I would explore the area around Place D’Italie. There are two subways stops within a few hundred meters of the hotel on the Nation-Etoile subway line, as well as a Velib station right outside. If you want a hotel with more American amenities and feel, this is the place for you. Otherwise, try to find a boutique hotel. What are some landmarks you’d rather avoid? The Sacré-Cœur is a beautiful spot but, wow, it’s even more touristy than the Eiffel Tower. This is the area where you will also find the Moulin Rouge. If you want to head-up there to take a look, do a quick fly-by, snap some photos and then cut back to Rue Caulaincourt and over to Montmartre Cemetery and walk around there (it is very nice), and then make your way past the Moulin Rouge to Pigalle Station. This is a worthwhile route, but only on your fourth day in Paris.